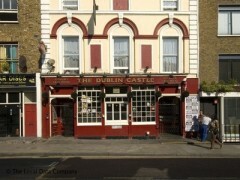 About: The Dublin Castle is a pub that serves a variety of beers, wines and spirits and snacks. This is a live music venue that has live music all week with up to three bands a night. Outside seating is provided on the pavement. As one of London’s most recognizable music venues, The Dublin Castle needs no introduction. Live bands every Friday, Saturday and Sunday, with DJs following for the rest of the night; and what’s more, there’s even table tennis there now! Most nights at the Castle, you can get to see four live acts, sometimes five. Great vaule even if a few of them might not be to your liking. The music side of things here are brilliant. Though the staff sometimes don't do the correct drinks, ie a mate of mine asked for a Lemonade and was given half a glass. Though I only come here to see bands, not to drink at the bar.